At Alan’s Factory Outlet, we carry metal carports and large metal buildings in sizes as large as 32, 34, 36, 38, 40, 42, 44, 46, 48, 50, 52, 54, 56, 58, or even 60 feet wide. Metal garage lengths can be 20, 24, 28, 32, 36, 40, 44, or 48 feet long. 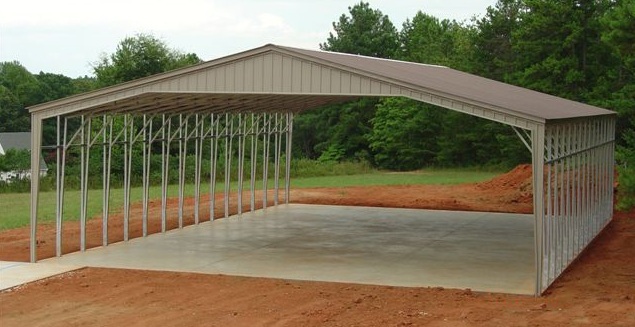 And we can connect metal carport buildings end to end to make even larger sizes, such as 50x80, 50x100, 60x80, or 60x100. No matter how big something is or how much you have, we can help you protect it with our extra-large metal sheds, carports, garages, and storage buildings! The carports we sell in these styles and sizes are made of sturdy corrugated steel. All of our 32-to-60-foot-wide metal buildings come with a vertical roof, a design feature that allows snow to slide off of the roof instead of weighing down your building. Sides and ends can be put on these portable storage buildings to enclose a carport into a metal garage. The carports and garages’ sides and ends are vertical. These metal carports and garages have a special truss support at each bow, which makes them rated for either 170 mph wind and 35 pounds per square foot of snow or a heavy snow load of 65 psf and 105 mph winds, depending on your local code. The customer is required to provide a telescopic forklift during these carports and garages’ installation; the lift needs to go 10 feet taller than the leg height of the metal building. 50x80 metal building with 14' leg side height, 3 12x12 garage doors, 9x8 garage door on the side, 3 windows and deluxe two tone. Free delivery and installation are included with all of our 32-, 40-, 50-, and 60-foot-wide steel buildings in AL, AR, DC, FL, GA, IL, IN, KS, KY, LA, MD, MS, MO, NJ, NY, NC, OH, OK, PA, SC, TN, TX, VA, and WV. All of our metal carport buildings also come with a one-year workmanship warranty from the date of installation. Need more than our standard carports and garages? Alan’s Factory Outlet also carries Amish-built sheds and other types of portable building units. These buildings can be built with 14-gauge steel tubing or a thicker 12-gauge steel tubing. The framing on all of the 14-gauge tubing and 12-gauge tubing comes with a 20-year rust-through warranty to ensure that these metal carports and garages are long-lasting. Our 32-to-60-foot-wide metal buildings are anchored for free to your level concrete pad with cement anchors or to the ground with mobile home anchors. The side height on these steel buildings comes standard with 8-foot legs but can be made taller with a 10-, 12-, 14-, 16-, 18-, or 20-foot-tall side height. The 32-to-60-foot-wide metal buildings come standard with vertical sides and vertical ends. For the same price, you can get your steel building made with lap siding upon request. Lap siding is still metal siding, but instead of going up and down like vertical siding, which comes standard, it goes side to side horizontally to make it look like vinyl siding. The above structure also had deluxe two-tone siding, which is available as an upgrade. Do Metal Carports Require a Permit? This depends on the size of your carport and your area zoning laws. Some places may require a permit even if the carport is very small, while others only require a permit for buildings of a specific size. Check your local laws to find out the requirements in your area. They can often be found on your municipality’s website. How Much Do Carports Cost? For a steel building with a vertical roof style, you can expect to pay starting between $5,695 for a 32x20 carport and $17,995 for a 60x40 carport with 8' legs fully open, but prices will vary based on the specific size, region and features of your structure.